for this swap please send your partner a souvenir fridge magnet from where you live. 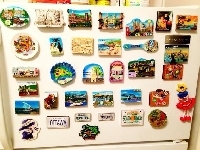 I love fridge magnets, I collect one every time i go on holiday. All you have to do is send your partner a fridge magnet with the name of the place you live. write a letter to your partner explaining something interesting about where you live. Maybe a special landmark or something like that.